I've always wanted to dye my hair red. And I just found out my sister has also been wanting to dye her hair red. Since I've never dyed my hair I was a bit skeptical about doing this. Well, it was fun thinking and talking about dyeing my hair but I've never really actually think I'll do it. My sister was really excited though, so as not to damper her spirit, I decided to go with it. My sister and I are both lancers, and the minute we got the payment from a project that we both worked on, we decided we'll allot some to be our 'dye' money. I wanted to buy this dye called 'Manic Panic', but the price for the semi temporary dye was over $20 (price from a local seller) and since we would both be coloring our hair, it would be too expensive. We just settled going to our local HBC store for cheap dye. We were looking at the color swatches in HBC, when we saw this color, 'Flame'. 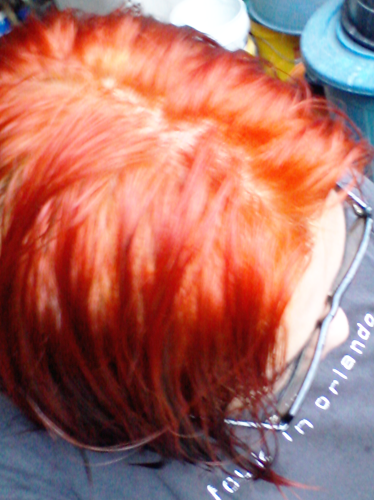 It was really vibrant and sort of like Manic Panic's 'Wildfire'. Unfortunately it was not in stock. Actually, there wasn't much red color in stock. We settled for dark color red (with a hint of brown) color called 'Copper'. I've read somewhere that you can't get the actual color on the swatches if you have dark colored hair, so we also bought two packs of hair bleaching powder and 2 bottles of 12% oxidizing lotion. Other things that we bought are shower caps, plastic gloves, tint brush and 2 bottles of 9% crystal gel developer. Overall, we spent less than $12 for all our purchase. - I didn't shampooed my hair prior to bleaching, well, I don't really know if you're supposed to. But since the bleaching process is going to strip you hair of it's natural oil (among other things), I figured that it was best not to. -We mixed one pack of the powder with one small bottle of the oxidizing lotion (whew, the bleach smells awful). - We followed the instructions that was written at the back of the powder pack. Apply the bleach first around 4-5cm away from the roots. Then work your way down until the ends. We used another pack of powder and another bottle of the oxidizing lotion since one pack didn't cover my entire hair (so my sister didn't get to bleach her hair). - Tip: You can leave it on your hair longer until you get your desired color. It'll damage your hair more though. - I shampooed my hair with 'Garnier Fructis Sleek and Shine Fortifying Shampoo' 3 times until the bluish residue from the bleach was gone. Then, I conditioned my hair with 'Cream Silk Damage Repair'. I only used a sachet of conditioner since I've read somewhere there isn't any difference with applying loads of conditioner and applying just the right amount to cover your entire hair. Since hair bleaching didn't went as well as planned, I was too keen on coloring my hair red to cover up my bleached hair. Since it's not evenly bleached, I know the red color won't be even but since the color on the swatch was dark, I figured out it will be okay. -The instructions that came with the dye said that I should shampoo my hair prior to coloring. 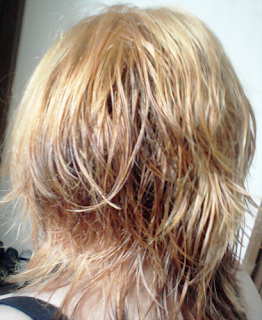 Since I just washed my hair, I mixed 1 tube of hair color with one bottle of the crystal gel developer solution. My sister didn't washed her hair, but wants to color her hair anyway, and mixed her own batch. - We just used our hands (with gloves of course) and applied it to our hair. We raked our fingers in our hair, hoping the dye was evenly distributed. - I waited for around 30 minutes before washing my hair, my sister waited for less than 20 minutes. - I just shampooed my hair twice. I wanted to wash it more since it smells awful (but not as awful as the bleach) but I don't want the dye to wash away. Then I used conditioner. Though some parts look orange, it's actually all red. My hair wasn't anything like in the swatch. It was bright red on top and gradually getting darker down. My sister's hair color was closer to the swatch. We didn't have to bleach our hair after all. After a few minutes of shock, I was starting to like my hair. It kinda grew on me. My niece got scared though, and started crying when she saw me and refused to go near me. I finally decided to use a dark colored dye as 'low lights' to tame my hair. I saw a pack of black Henna lying around the house so I used it. I just used gloves and raked it through my hair. I paid special attention to the roots since it might look weird for me having red roots. I don't really know how long I should leave the Henna on my hair, it just said on the instructions that you just have to wait for it to dry. I was watching TV to kill time when my sister shouted "OH NO, YOUR HAIR TURNED TOTALLY BLACK". I looked at the mirror, and it really did. My hair was still wet from the dye but I jumped in the shower to wash my hair. I shampooed my hair thrice. Then conditioned it. My hair turned out really really black which I found weird on me. I'm going to color my hair again, but I'm waiting for my hair to return to it's original texture. I've been conditioning my hair with 'Cream Silk Damage Repair' every time I wash my hair and my hair's dryness and brittleness from the bleach and dye were considerably less. I bought a pack of 'L'oreal Total Repair Deep Repairing Mask' but haven't used it yet. - If you really insist on doing it on your own, research on how to do it, what products are the best etc. nagpacolor ka nga? lol. di ko tinapos basahin. :| nagnanakaw lang ako ng oras eh. haha. :)) bat di na kita nakikita sa schoooool????? :< IMY. It was a dull shade of dark brown before.